When I lived at the flat, my living room - the main room in the house, was decorated with a black wallpaper featuring cream butterflies, whilst the walls were painted cream. Luckily the room was large with two sets of bay windows and a standard double window meaning I had three lots of natural light coming into the room. However, the living room here at the house is a smaller room, with two sets of large windows, allowing natural light in, but not enough to make the room dark. 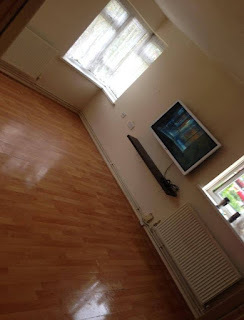 My living room at the flat, this picture was from he day I moved! Wanting a whole new change, I took the plunge and decided to go with bright colours this time round! 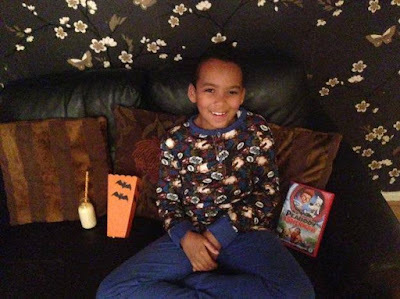 I didn't have a particular colour in mind, but I did have to consider the furniture I already had - two black leather sofa's, a light oak dvd stand, a light oak TV unit, a dark wooden writing bureau and a dark wood mantelpiece shelf, so certain colours like orange would clash! The wallpaper at the flat. I went shopping for wallpaper, and fell in love with a beautiful teal, gray, white and black wallpaper which also had sparkles, my mind was decided! 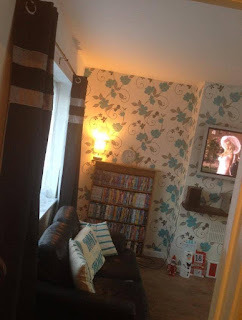 With the main colour being white, I decided to have one feature wall with the wallpaper, and the other three walls of the living room painted white as soon as the plastering was done! Whilst looking for other teal related items to fill the room with, I come across some beautiful pieces from Calibre Furniture, they sell furniture from every colour of the rainbow basically, however, I sadly wasn't in the financial position to buy new furniture, plus if I ever wanted a colour change, it would cost me a small fortune. I have however found some stunning pieces for a home office I would love to have one day! Skipping the furniture part, I thought of other ways to bring teal into the home, and instantly decided on accessories. 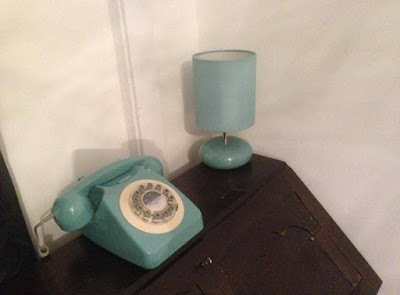 I went out and got two teal lamps, a teal candle vase, teal candles, teal scatter/sofa cushions in two different designs and even a teal antique phone! 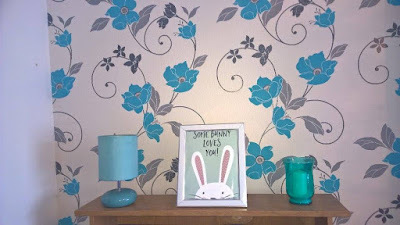 I also accessorised with a white mantlepiece clock and a white ceiling light shade! I'm still debating on whether or not to buy a teal rug, but after getting a puppy dog who malts hair like no tomorrow - I can imagine the rug turning white in 10 seconds of it being down! For the window area, I went with white net curtains, featuring birds, twigs and bird cages which go with my wallpaper, clock and ceiling light shade. 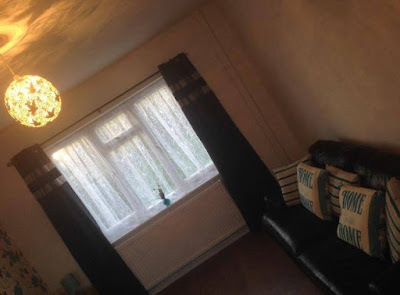 With the curtains, I decided to go with black and gray floor length curtains, which to be honest are quite a pain as one of windows have the radiator below it! I also went with black curtain rails, to go with the black on the wallpaper and the curtains. Bringing colour into your home doesn't have to cost a fortune, I managed to bring a few of my favourite colours into my home on a small budget! The most expensive buys were the curtains and teal phone, but all of the items were under £50 each, with some costing an affordable £3.99! 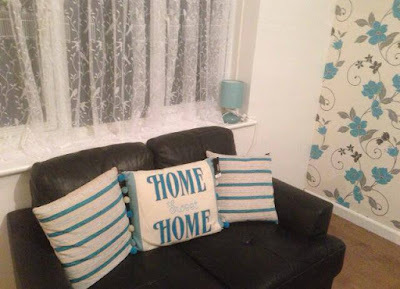 If you want to bring colour into your home, and get rid of the dullness then do it! I was always afraid incase it ruined the room, but it was the best decision I made! Everyone who has been to my home compliments me on the living room and there hasn't been a single person who hasn't asked where my wallpaper is from! Luckily, to my knowledge, no one has copied me just yet!